With a big, booming voice and promising musical chops, Aubrey left for Houston at the age of 16 and began sitting in with western swing bands that borrowed heavily from the Texas roadhouse blues and jazz tradition. By the end of the Thirties, he had built a fearsome reputation as a one-man wrecking crew on piano – not to mention his taste for booze, which probably earned him the moniker (short for “moonshine”?) that stuck with him throughout his adult life. Mullican showed up on the charts one last time with a lively remake of his original Ragged But Right, but an onstage heart attack in ’62 slowed him down considerably. Overweight (and often overserved at the bar), Mullican suffered a major coronary on December 31, 1966, and died the next day. Two years later, Kapp Records released an album of sessions produced in the early ‘60s by Cowboy Jack Clement. 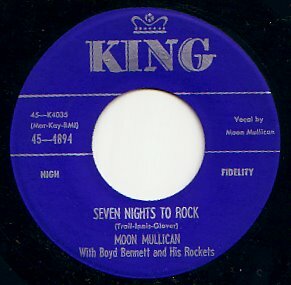 The Moon Mullican Showcase quickly disappeared into obscurity, as did most of Moon’s recordings. 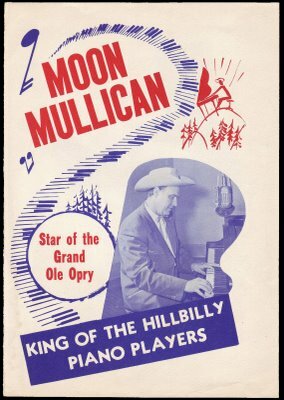 Moon Mullican was a great singer, piano player and songwriter. He recorded so many lovely country songs like “The leaves mustn’t fall” and “There’s a chill on the hill tonight”, as well as doing blues songs like “Pipeliner blues” and “Early morning blues”. When he did uptempo R&B material like “Rocket to the moon” and “Let me rock you baby”, he was hinting at rock ‘n’ roll. 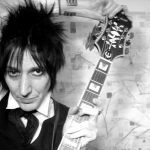 Many of the rock ‘n’ roll pioneers especially those in Texas and Lousiana such as Jerry Lee Lewis, Roy Orbison and Buddy Holly were deeply influenced by him and even met him and knew him personally. Perhaps those 3 rock ‘n’ roll era singers I mentioned who were so versatile took their inspiration from Moon, who was also very versatile. 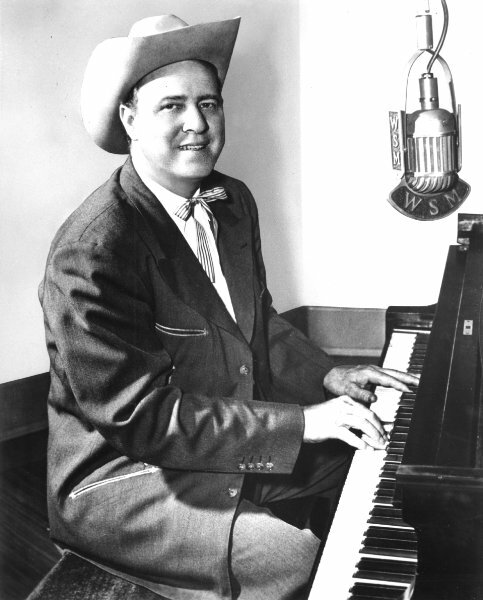 During the years, Moon recorded swing (“I don’t know why”), blues ballads (“Lay me down beside my darling”), bluegrass (“The lamp of life is burning low”), western swing (“I’ll keep on loving you”), honky tonk (“I don’t know what to do”), jazz (“When you’re smiling”), gospel (“I’m gonna move home bye and bye”) and ragtime (“Ragged but right”) among other styles. Like many singers of his time and after, Moon was caught between religion and music. Born to a Methodist family, Moon learned decency and kindness from here and helped anyone he could. 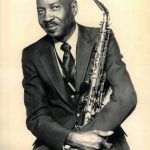 He also was a great singer of religious songs but the blues such as “St Louis blues” held more sway musically. When he became a major country hitmaker, Moon’s blues style can be heard on songs like “Worries on my mind” and his big hit “I’ll sail my ship alone”. Moon inspired many singers: the rock ‘n’ rollers I mention, along with outlaw country legends like Willie Nelson and Waylon Jennings. I as a singer here in Ireland have recorded many of Moon’s songs and people love them and sadly Moon is not wellknown in Ireland (despite it being one of his ancestral countries) but I aim to change that. 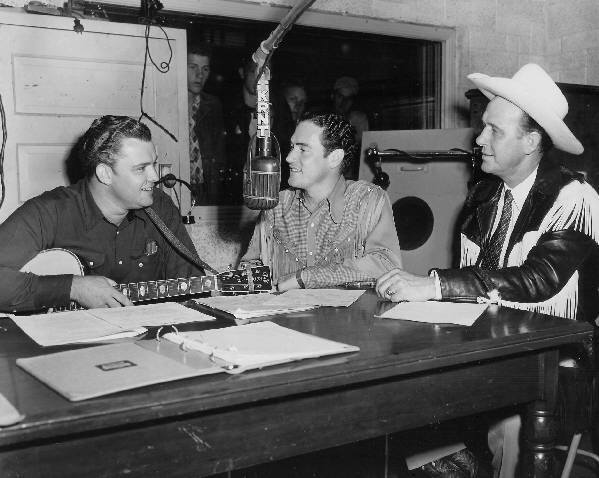 Moon deserves much more credit and he is along with Bill Monroe, Hank Williams, Jimmie Rodgers and a handful of others, one of the main founders of pre-rock ‘n’ roll country music. Thanks Patrick from Ireland. Would love to visit your fair country and hear you pound out a few tributes to Moon.